Good news–many easy to make Halloween costumes are perfect for convention costume parties! There are a great number of people who look forward to these convention parties all year long, so when the time comes they want creative Halloween costumes that are going to turn heads. Luckily there is a wide variety at the Glendale location. 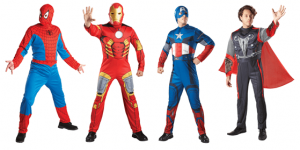 Consumers will find that these costumes offer a variety of uses as well. From office parties to traditional Halloween parties, on to cosplay, anime and Sci-Fi themes–there is definitely something for everyone who likes to dress up. Just explore and you will find that perfect costume you are looking for!